On July 4, Putin and Xi Jinping concluded two days of informal and formal talks in Moscow – above all else, affirming the vitally important relationship between themselves and their countries. 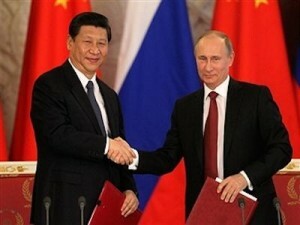 China is Russia’s largest trading partner. Considerable potential remains to be developed. Each nation contributes significantly to the economic health of the other. “President Putin and I attach great significance to trade and economic cooperation between China and Russia and (their) development,” said Xi. “Trade turnover amounted to $69.53 billion and grew by 2.2% compared to 2015.” During the first five months of 2017, it “surged 26%. Expectations are that trade turnover may be over $80 billion” by year-end. A China/Russia investment fund is involved in the Far East of both countries. A Russian company floated Panda Bonds on China’s exchange for its ambitious One Belt One Road initiative. Both leaders urge a denuclearized Korean peninsula, a freeze in Pyongyang’s ballistic missile program, provocative US-led regional war games halted, resolving issues with Pyongyang diplomatically, belligerence ruled out, respecting the DPRK’s sovereignty, and removal of so-called Terminal High Altitude Area Defense (THAAD) anti-ballistic missile systems in South Korea. They’re more about targeting Russia and China than the DPRK. Unrelated to their stated goals, they gravely threaten the strategic security of neighboring countries. Their presence undermines regional peace and stability. Trump and neocons infesting Washington threaten humanity. Sino/Russia ties represent a vital counterforce to the unprecedented menace they pose.